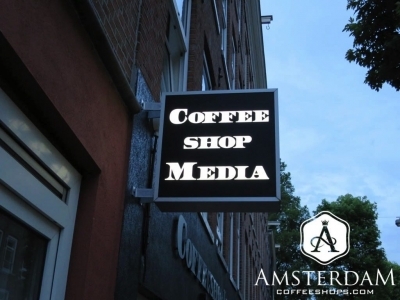 Club Media coffeeshop is located in Oude Pijp (the Old Pipe), a trendy neighborhood in Amsterdam Zuid (South). There is an amazing diversity of independent restaurants, cafes, bars, and boutiques here. 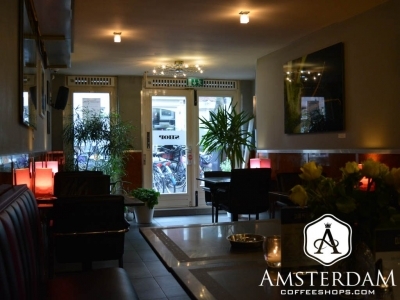 This coffeeshop also sits right adjacent to the Albert Cuypmarkt, the largest outdoor market in the Netherlands. This is undoubtedly a lively section of the city, attracting many locals and tourists alike. 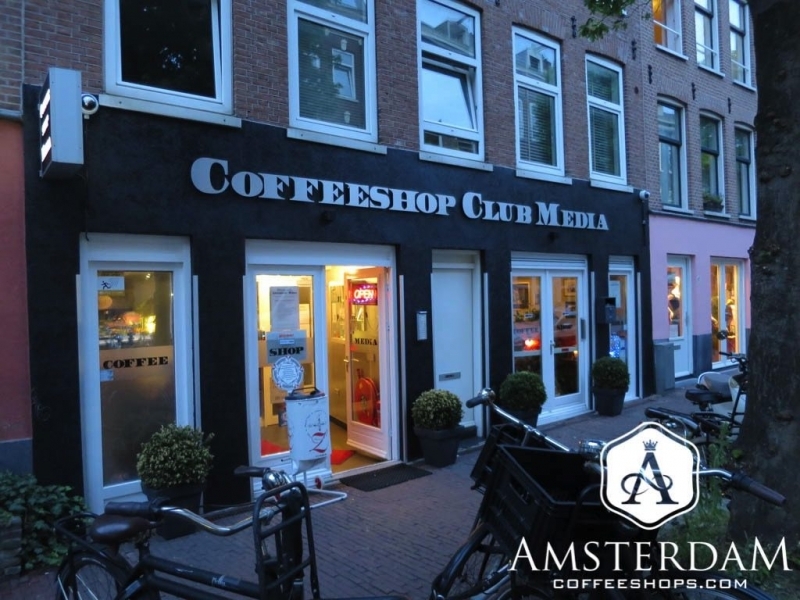 Club Media is a trendy independent shop itself, and seems to fit in quite well with the area. 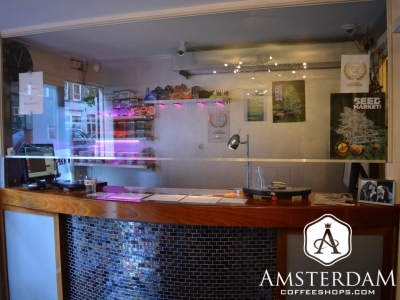 As you first enter, you will find the cannabis ordering counter. This is efficient. Club Media is a popular pickup spot for the locals. Hopefully you are here to stay a bit, though. The lounge area in the back is well worth some time. Inside, one will find a room that is open, welcoming, and bright. Club Media has a unique feel to it. It is a bit funky, a bit traditional, a bit urban. We would compare it to a modern restaurant that purposefully mixes contemporary and classical elements to create its own artistic expression. It is all quite cool. Prime seating is found in the form of purple and black leather benches, which are pushed against many of the walls. They are soft but supportive, and very comfortable. In front of them are small cafe tables and pull up leather chairs. There are also in sets around the shop. In addition, you’ll find some bar seating. 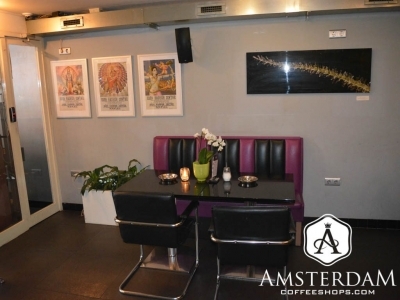 They use thick chrome stools with round black and purple leather seats. It feels like they were ripped from a 1950s’ diner. A nice touch. Off to one side is the tobacco lounge, which is closed-off behind a glass to comply with EU tobacco regulations. 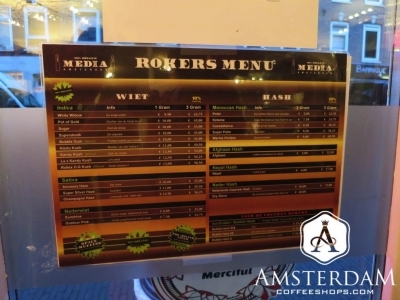 The cannabis menu is robust at Club Media. The weed-side typically carries more than a dozen strains. The genetics are a clear mix of old and new. 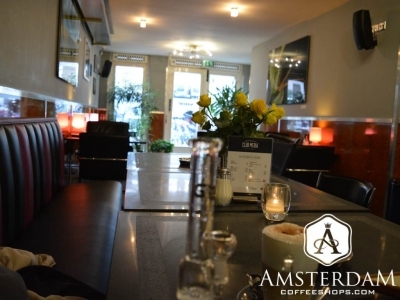 You can expect some old-school Amsterdam strains here. Remember, this city cultivated so much of the genetics used in hybrids today. Some of these contemporary strains are probably sitting beside the classics here. The hashish side of the menu is smaller, but possibly even more noteworthy. 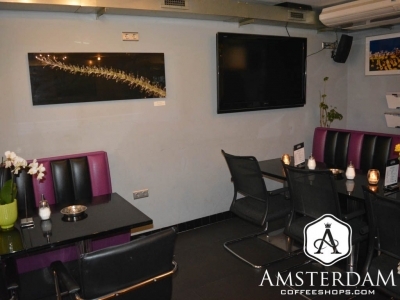 We find this place to be a “Best of” location for hash, with an excellent variety of quality imports and more potent Nederhasj (Ice-o-lator). Another nice feature is the Volcano vaporizer. 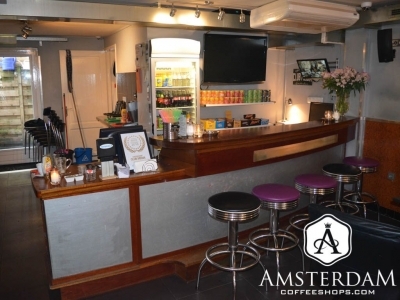 They also make great coffee, and have plenty of basic drinks and snacks.